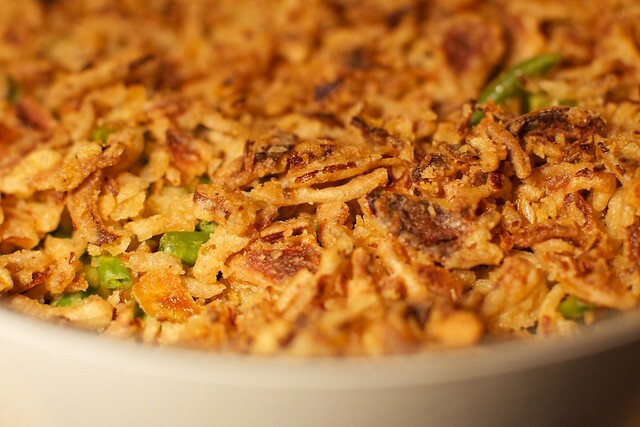 Last year we attended a mondo Thanksgiving potluck and one of the recipes we left dreaming about was for this fantastic Green Bean Casserole. I have never particularly had very strong feelings either way about green beans but this dish will make you want to eat them day in and day out. Smothered in a flavorful and slightly cheesy sauce, these green beans will steal your heart (and your belly I suppose). Oh and did I mention, they’re topped with those awesome fried onion bits. Yum! With Thanksgiving just around the corner, I wanted to make a few dishes early and stretch out the tastiness. Why only eat Thanksgiving food on one day a year? That being said, I’ve eaten this dish for 3 meals in the past 2 days. It’s that good. It’s also incredibly easy to make, almost as easy as it is to eat. I doubled the recipe to make it last even longer and just increased the cooking time a bit and it came out fantastic. Here is the recipe! In a small saucepan, melt the margarine and add the flour. Add the vegetable broth, soy sauce, garlic powder and onion powder, stirring frequently, until sauce thickens. Whisk in the vegetable oil and nutritional yeast. Toss together the sauce and green beans in a casserole dish. Bake for ten minutes. Remove and sprinkle the French fried onions on top of the casserole. Bake for another ten minutes. You know, I actually bumped green beans from our menu this year. You’ve got me rethinking that! 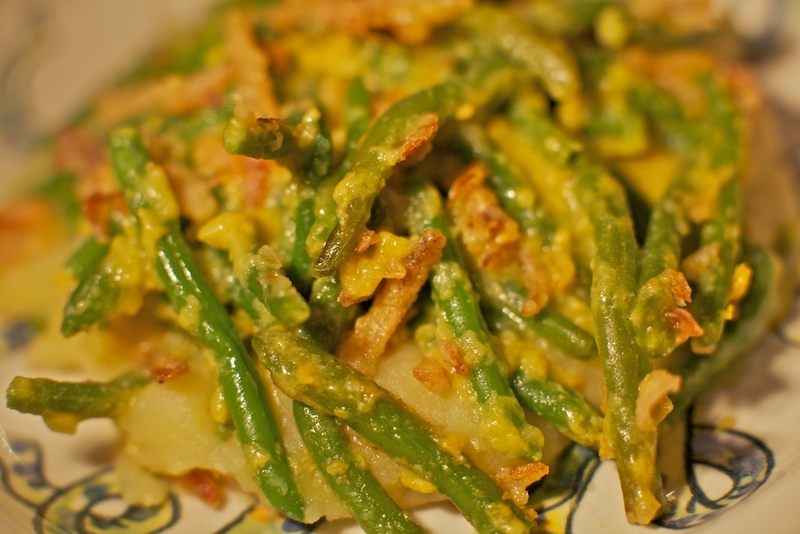 This green bean dish was one of my faves as well, I think I want to make each and everyone of those dishes again… and this one for the first time! yum! i had thanksgiving in april this year and those were the main course. i ll have to track down nooch and try your version this year. THANK YOU! We will be making this for SURE. awwww that was a really great potluck! fond memories x 1000. I have a feeling my sister will love this recipe! And most likely eat it for all meals for a couple days as well! This is my favorite side dish and I hadn’t had it since I went vegan. I just made this last night for myself and a couple meat-eating (extremely skeptical) friends and everyone (including me to be honest) was shocked by just how good this is. SO DELICIOUS. I just wanted to say thanks for this recipe! It was BY FAR mine and my husband’s favorite thing that we made for Thanksgiving this year and there were some other really yummy dishes, so that is a big compliment!